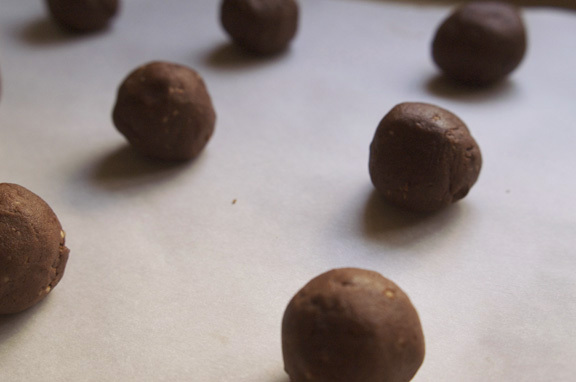 the chocolate chronicles, part one: mexican hot chocolate cookies. This was never supposed to be a series. I honestly don’t know what came over me. There I was, toodling along, eating salads and making fruit things, and it struck me. Chocolate. And it occurred to me, in that moment, that I hadn’t had a real chocolate dessert in ages. If this little corner of the internet is anything, it’s a reflection of what I’m eating, and there hasn’t been one predominantly chocolate post since March; those little chocolate pretzel cookies. Before that, my annual Buche de Noel, and we all know when those show up: Christmas. That’s right, people; I haven’t really done anything chocolaty since last year. That’s about to change in a big way. As I think about it, I’m not surprised. I think everyone is guilty of over-chocolating during the holidays. There’s chocolate paired with peppermint, chocolate paired with orange, chocolate paired with butterscotch and five other ingredients, chocolate paired with, well, more chocolate. It’s everywhere and it’s delicious and by the time the holidays are over, I almost can’t even taste it anymore I’ve had so much of it. And so, I flee from chocolate. I run for the non-chocolate hills. But now I’ve returned to the hills like Maria in the opening credits of The Sound of Music with a few things you may enjoy, because my taste for chocolate is back. And I’ve got some new cookbooks to play with. 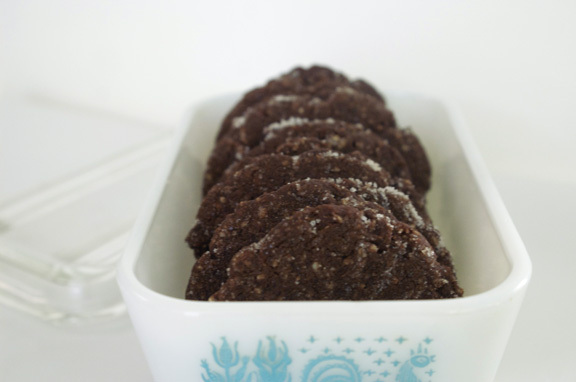 So let my recipe-testing make your chocolate cookie dreams come true. I’m going to give you three simply glorious odes to chocolate cookiedom, and then i’m going to give you a little bonus project to do with whichever one you choose. First up, the Back in the Day Bakery. I love this cookbook. I know I’m “in a relationship” with a cookbook when I find myself flipping through the pages at night, several nights in a row, wondering what I should make next. It’s like sitting next to the phone daydreaming about a future date with someone you kinda, you know, really maybe like and stuff. And I want plenty of future dates with this one, let me tell you. It’s packed with some seriously great recipes (sweet and savory! ), gorgeous photos, and lovely tips. This recipe was one I couldn’t stop looking at. I mean, Mexican hot chocolate cookies. Mexican. Hot. Chocolate. Inside cookies. Coated with sugar. But here’s why I actually made these. Vintage glasses as cookie stamps. GENIUS. I do not own a cookie stamp. 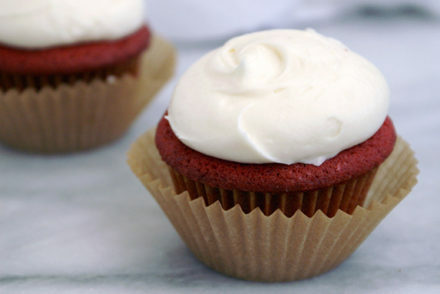 I’ve seen cutesy-pie ones, and since I’m not a “cutesy-pie” type person, I’ve passed them by. But no one told me I could use old vintage crystal glasses with patterns on the bottom to stamp my cookies. Why didn’t this dawn on me before now? Does anyone have any idea how much grief I get from Mr. Table for rescuing random and sundry dishware and other cooking accessories from thrift stores because “I’m sure I’ll use it!” I could have staved off (some of) his valid points nonsense by giving him an actual example of how things could be used. Dear Mr. Table: I’ll be using these useless vintage thrift store finds I have far too many of beautifully made artifacts from a bygone era to smoosh and sugar-coat cookies. Now hush up. Just look at how fun these are. That’s gorgeous, what the bottom of a whiskey glass can do to a cookie, right? It gives you a new appreciation for decorative glassware. Also, it gives you something to say when you walk through thrift stores flipping over every glass and small dish like a person with compulsion issues. Because that’s what I do now; I need more cookie stamps. Design fun aside, these are amazing cookies, and so easy to make. I think I made them inadvertently easier by doing the refrigeration bit before you roll and stamp them. I say “inadvertently” because I confused the order of things around in my head when I made them the first time. However, I feel that refrigerating the entire dough right off the bat is much easier than rolling and stamping room temperature cookies and then carefully sliding them in and out of the fridge. Certainly it’s less time-consuming, and my fridge is a much more comfortable place when there’s not 3 sheets of flattened cookies chilling in it. The dough stays cold as you’re rolling them, and whatever doesn’t fit on your sheet pan can go right back in the fridge until you’re ready for it. I altered the recipe as well. You see, I’m a big softie when it comes to almond flour. I adore it. And if you give me a recipe with regular and almond flour, I will find ten ways to adjust it to get more almond flour in there. This was no exception. I prefer fresh-ground almond flour using blanched almonds to the store-bought, already-ground flour – there’s a texture there which makes a difference. I also feel like real Mexican hot chocolate is big on bold flavor, so I heaped (rather than level teaspoon-d) the cayenne, cinnamon, and coffee. You don’t have to go crazy (especially with the cayenne), but I’d encourage you to live a little on this one. You won’t be sorry. If I can warn you about one thing before I go, it’s this. Sometimes, when I’m feeling particularly lacking in willpower, I put my cookies and/or other baked goods in the freezer. It’s like how some financial advisors tell you to freeze your credit cards in a coffee can filled with water when you can’t stop using them: if you get the urge, by the time you’ve removed your frozen credit cards and they’ve thawed, the urge will have subsided. Or you will feel dumb for sitting watching a giant can-shaped block of ice melt because you “need a few things” from J. Crew and Anthropologie. This same principle typically works with baked goods. Except for these cookies. Ever heard of frozen hot chocolate? Ever hear people rave about how amazing, truly astounding, frozen hot chocolate is? Well guess what: frozen hot chocolate cookies have the same magnetic appeal. Perhaps even more so, because these are already addictive due to their Mexican-ness and their portability. The freezer will not save you this time. Eat them frozen. Eat them not frozen. Eat them all the time. Adapted from the Back in the Day Bakery Cookbook by Cheryl Day and Griffith Day. Whisk all-purpose and almond flours together in a medium bowl and set aside. Whisk together the brown sugar, cocoa powder, cinnamon, espresso (or coffee), slat, and cayenne pepper in another medium bowl. Set aside. In the bowl of a stand mixer fitted with the paddle attachment (or in a large bowl using an electric mixer) cream the butter, vanilla, and almond extract together on high speed until the mixture is pale in color and fluffy, 2-3 minutes. Scrape down the sides of the bowl. Reduce speed to low and add the brown sugar and spice mixture, mixing until fully incorporated and smooth, 3-4 minutes. Scrape down the sides of your bowl again. With the mixer still on low, add the flour mixture in two parts, mixing each time until just combined, for a total of about 1 minute. Scrape down the bowl once more, add the chocolate chips, and mix for about 20-30 seconds more until the chips are evenly distributed. Remove mixing bowl from stand mixer and, using a rubber spatula, scrape down the sides of the bowl all the way to the bottom, turning the dough over and checking to see that everything looks evenly mixed. Thick dough, such as this, has a tendency to cling to the bottom, so don’t skip this step. Cover the bowl (or place in a different container and cover) with plastic wrap and place in the fridge for at least 2 hours until firm and chilled. Once thoroughly chilled, you can make your cookies. yay! Preheat oven to 350˚F, placing your baking rack on the lower third of the oven. Line a baking sheet with parchment paper. Ready your granulated sugar by placing it in a shallow bowl (like a soup bowl) or lipped salad plate. 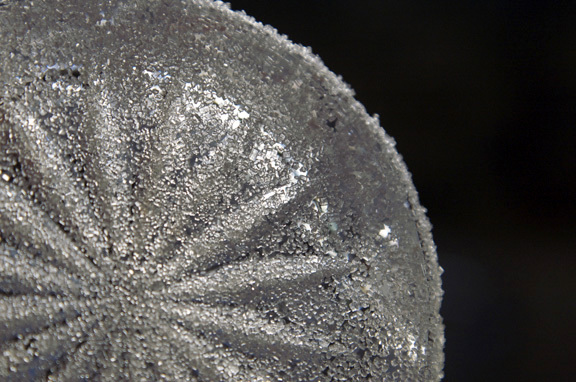 Spray your cookie stamp or bottom of a decorative glass with a little cooking spray. 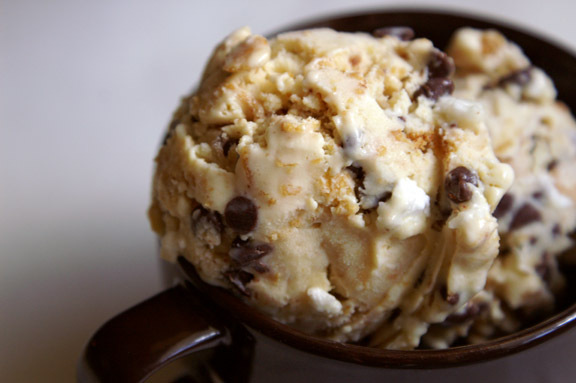 Using a small ice cream scoop or spoon, scoop out rounded tablespoons of cookie dough and shape them into balls, using your hands if needed. I roll them lightly around in my palms a few times to make sure they’re smooth. Place them on the prepared baking sheet about an inch or so apart. 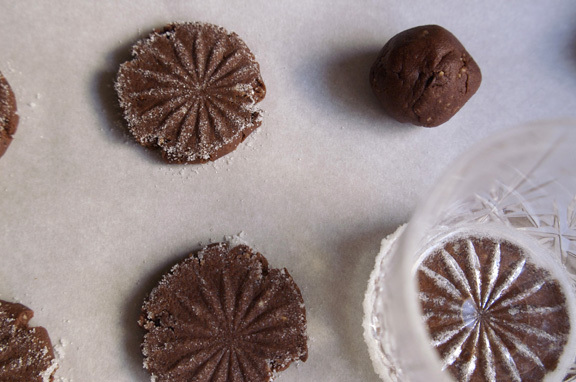 Once you have the balls on your sheet pan, dip your prepared stamp or decorative glass in the granulated sugar, then press evenly and firmly down on each cookie ball. Re-sugar after each ball press. If your cookies begin to stick to the bottom of the stamp/glass, wipe down, re-spray with cooking spray, re-sugar, and keep going. If you feel you want to, dust your completed trays of cookies with more of the sugar. I didn’t, and I don’t know that it makes much difference. Place in the oven and bake until edges are firm to the touch, 8-10 minutes. When in doubt, err on the side of taking them out. If they are crumbly or seem to be very fall-apartish, put them back in for another minute or two. I know chocolate cookies can be difficult to detect doneness on, but these should take no longer than 10 minutes. Mine were done in the 9-minute range. Remove from oven and let cool for 10 minutes or so on the baking sheet. Transfer to a wire rack to let cool completely. Cookies can be stored in an airtight container for up to 4 days at room temperature and up to 2 weeks in your freezer. As I said earlier, these are simply phenomenal right out of the freezer, so perfect for a summertime snack. tina, i hope i live up to your expectations. I’m really excited about this; it’s been forever since i’ve had chocolate treats to test out! Ah, so many cute dishes. 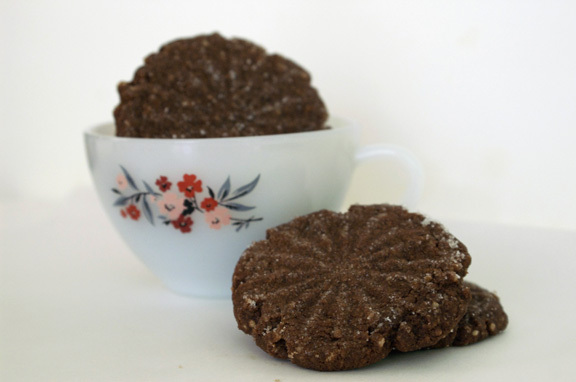 Get out there and compulsively make up for all those years you didn’t know to use glass bottoms as cookie stamps! i’m on it: i have a trip to the Goodwill (or several, perhaps) and a few of my favorite other thrift stores planned this weekend. SO excited now that my dishes have a purpose. i freeze EVERYTHING, and the only way it helps is because if i really want that cookie, but it’s frozen, i have no patience for it to thaw so i just leave it in there… i still have several of my valentines cookies in the freezer. they are there for emergencies…. and i’m with emma on this one – no such thing as “over chocolating” (although my pants my disagree) and i adore your dishes! so many cute things! my kitchen is overflowing with dishes …. :-\ but there are still so many more that i need…. I can’t go TWO DAYS without chocolate. No chocolate since December?! Girl, get on this series. It needs to be done. Your cookies, as stamped, resemble the lids on my mother’s Tupperware canisters that have rocked it in every kitchen she’s had since before I was born. I am swimming in nostalgia! you and emma! my goodness, ladies; is there something in the water up there?!? 🙂 i’ll get right on it…you will love this next one up. it’s the Momofuku chocolate cookie, and i’m using regular chocolate versus the high-end sort, just to prove that things also are delicious with a mid-grade that you don’t need to make a special trip to purchase. oh. my. goodness: YOU ARE SO RIGHT! THAT IS EXACTLY WHAT THEY LOOK LIKE! i’m so happy you said that: when i saw the design, they reminded me of something “old” from my childhood, but i couldn’t for the life of me think of what. Now, i remember. Now, i am swimming in nostalgia with you. In a harvest-gold-and-avocado-with-white-lids pool of nostalgia, to be precise. you are a dear. Wow! I want one. Well, maybe more than one- like, 6. 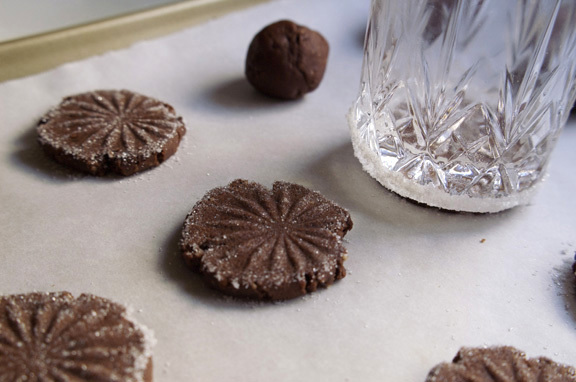 I love the idea of using a vintage glass as a cookie stamp. How creative. I would have never thought to do that. Some people are just so creative. I can’t wait to see what else you’re going to bestow on us. i know, right! i was almost kicking myself for not thinking of the whole “bottom of a glass could be a cookie design” thing. it’s like it’s been right in front of my face this whole time and i never even saw it until the Back in the Day Bakery pointed it out. Why even buy cookie stamps when you can totally repurpose dishware? i can’t wait to bestow the next two cookies on you. i’ve already made one recipe, and it’s to. die. for. and i’m only guessing the next one will be the same way. I am in the midst of a hellishly hot and busy work week. I am currently giving speech ice cream parties at 7 different elementary schools to approximately 300 children. And I need a retreat. Or possibly, a treat. So, my sweet friend Shannon made me hot chocolate cookies. And she says they’re Mexican…which means I should eat them wearing a sombrero, I think. When Shannon comes to visit, we will do just that…on the Texas front porch…with a pina colada. Or something nice and cold because it is literally 10 degrees hotter than the surface of the sun here right now. Jen, i feel like you’re right: you need a “re-treat.” which is why i’m going to make you this cookie plus TWO WHOLE OTHERS and you can eat them all, wearing a sombrero, and i just want you to sit back and relax and i’ll make the drinks. you put your feet up and enjoy. it’s your last week of work and then you’re done for the summer! i had a feeling you would appreciate this. the chocolate goodies i have coming up are incredible. so incredible, in fact, i swiftly sent them off to work this morning with Mr. Table. They can eat them; i can’t be trusted with delicious chocolate cookies right now, and the wee one isn’t big enough yet to tackle me on my way to the pantry to grab some.